BMW and Volkswagen cut production | What Car? BMW and Volkswagen have announced a reduction in working hours for 86,000 workers as they attempt to trim production to meet the reduced demand for new cars. BMW is cutting shifts for 26,000 of its employees during February and March - slashing production by around 10%. The models most affected are the 3- and 7 Series. VW is shutting five factories in Germany for a week in February, affecting around 60,000 workers. Production of the Golf, Passat and Phaeton models will be hardest hit. BMW said it hoped the reduced working hours would cut overheads and help it avoid mass redundancies. 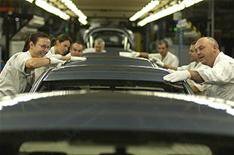 Car production in the UK fell by 47.5% year-on-year in December, according to figures from the Society of Motor Manufacturers and Traders (SMMT).